I’ve created the Dynamic Learning Framework to help with meaningful technology integration. This framework is actually at the heart of my book Shake Up Learning: Practical Ideas to Move Learning from Static to Dynamic. Today, I’m going to give you this framework for free, so you don’t even need to buy the book! Listen to the episode to learn about it, and stay tuned until the end of the episode to get your download bundle. Let’s dig into a question: does your classroom offer one-and-done learning activities, or does the learning grow, inspire, and evolve throughout the year and beyond? In today’s episode, I want to focus on that word “beyond.” In fact, my framework has five “beyonds: beyond the bell, beyond the grade level & subject, beyond the walls, beyond the tools, and beyond the due date. I’ll start off by exploring the idea of going beyond the bell. This means that learning doesn’t need to end when the bell rings, because many of them have digital tools and devices available any time, anywhere. Next, I’ll dig into going beyond the grade level and subject area, and taking students off the conveyor belt to give them a choice-driven education inspired by the things they’re passionate about. The third of the five “beyonds” is going beyond the walls. I’ll talk about both the world into your classroom, as well as bringing your classroom to the world. The fourth “beyond” is going beyond the tools, and this is one of my favorites! Going beyond the tools is so important in meaningful technology integration. Finally, I’ll talk about going beyond the due date. This one may be a struggle, but remember that we’re exploring dynamic learning experiences! Tune into the episode to learn about how going beyond the due date can be such a fantastic strategy for encouraging learning in many cases. 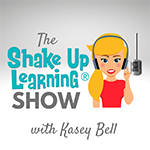 [00:28] - Kasey welcomes listeners to this episode, which will be about the dynamic learning framework for integrating technology into your classroom. [02:00] - We hear a shout-out to the TCEA Shake Up Learning Volunteers who helped Kasey survive the conference: Lyndi Christensen Valicek, Ashley Pursley, Meredith Jones, Sarah Fromhold, and Stephanie Martinez! [03:02] - Let’s talk about meaningful technology integration, and what it looks like! [03:57] - Does your classroom offer one-and-done learning activities, or does the learning grow, inspire, and evolve throughout the year and beyond? [05:12] - Kasey explains that there are five “beyonds” in her dynamic learning framework, and shares her philosophy in creating this framework. [10:24] - We hear a recap of the concepts of dynamic and static learning, which Kasey has explored in a previous episode. [12:07] - Kasey breaks down the dynamic learning framework, briefly explaining how to understand the graphic included with these notes. [12:54] - Kasey kicks things off by exploring the first of the “beyonds”: beyond the bell. [15:06] - We hear some strategies for going beyond the bell. [16:50] - Another activity that fits in with this segment is creating a vision board with Google Slides, Kasey explains. [19:24] - The next “beyond” is beyond the grade level and subject area. [20:32] - Kasey talks about some easy ways to take students off the conveyor belt and give them opportunities to go beyond the grade level and subject area. [23:11] - We learn about design thinking, a creative problem-solving protocol to create innovative solutions. [24:24] - Kasey moves on to talking about going beyond the walls. [27:54] - The next “beyond” is going beyond the tools, Kasey explains. [29:52] - Kasey talks about some strategies for going beyond the tools. [31:50] - We come back to the idea of the worksheet, with Kasey explaining the problems with this format. [33:47] - The fifth and final of Kasey’s “beyonds” is one you may struggle with: going beyond the due date. [36:15] - Kasey explores some strategies for helping kids to continue their work and learning beyond the due date. [38:23] - Kasey reviews the “beyonds” that she has covered in today’s episode. [41:20] - If you don’t already have your Epic Freebie Download, make sure you download it now! [42:43] - Here’s today’s Podcast Question of the Week: what is one way that you can beyond in your classroom that you’ve never tried? Please share the answers in the Shake Up Learning Community or on your favorite social media platform! [43:23] - This week’s challenge is to get the Epic Freebie Download, and share this episode with at least one other teacher! Also, check out the Shake Up Learning Book Study! [44:25] - Kasey talks about some free resources that you can get on the Shake Up Learning blog: her four free webinars! How to Get Google Certified!, 5 Things to Know About the New Google Classroom, 3 Things That Will Change the Way You Use Google Slides, and How to Create Dynamic Learning Experiences for Students.